Sipping the Trivento 2014 Eolo Malbec, I am reminded of the first time I sampled the Eolo while visiting the winery in 2013. At the time, I tasted the 2009 and my favorite wine of my visit that day. Much like the first time I sampled the wine, I feel it is still the most outstanding wine produced by Trivento. Trivento Eolo comes from a single block from one of the oldest vineyards in Luján de Cuyo. This vineyard is situated on the banks of the Mendoza River. 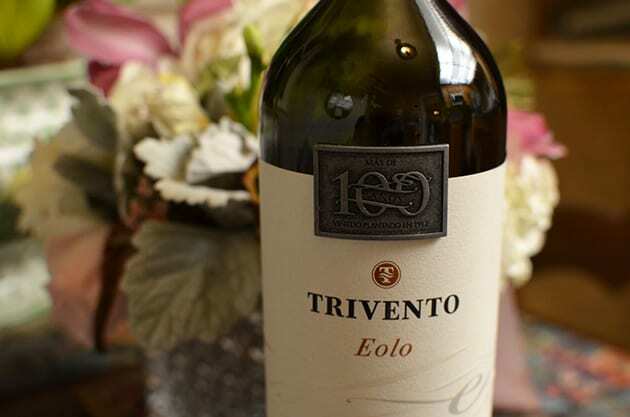 Eolo means keeper of the winds thus it is the keeper of the three winds that inspires the Trivento’s name, and it also signifies Trivento’s finest and most exclusive wine. Trivento means three winds. It represents the winds that descend on most vineyards in Argentina. These wines also delineate the seasons. They are the Polar, which comes in from the south and announces winter, indicating the time to prune the vines. The Zonda moves in from the Pacific and makes its descent from the Andes. The wind is hot and dry, which reinforces the budding on the vine, making a clear indication that watering must increase. Finally, there is the Sudestada, a southeast wind with cool and cold breezes that often leads to a summer storm that invigorates the grapes. These winds play an important role in the expression of the land and the growing of grapes thereby leaving their mark on the wines of Trivento. In 2009 the vines for Eolo were just under 100 years old while the 2014 vintage celebrates a Malbec vineyard that is at least a century old, thus representing old vine Malbec in a region that delivers new world wine. The Eolo vines lie within a 10-acre parcel situated in a 50-acre vineyard that was planted in 1912. The wine ages 18 months in 70% new and 30% once used French Oak. I described the 2009 as a mature wine with a complex structure and smooth balance. The 2014 Eolo exhibits similar qualities, but I found a rich, full-bodied wine with flavors of blackberry pie, dark cherry, dark chocolate, and tobacco. Any lover of Malbec especially those who appreciate Argentina’s signature grape must try the Eolo Malbec. The 2014 Eolo is an outstanding vintage to enter the world of Malbec.